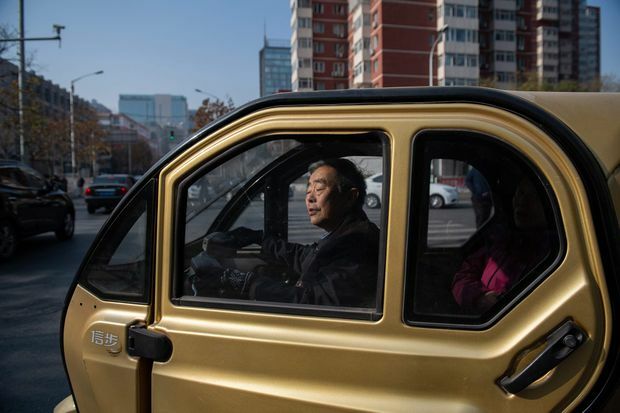 A man drives his electric car on a street in Beijing on Nov. 30, 2018. More than 200 manufacturers, including Tesla, Volkswagen, BMW, Daimler, Ford, General Motors, Nissan, Mitsubishi and U.S.-listed electric vehicle startup NIO, transmit position information and dozens of other data points to government-backed monitoring centres, The Associated Press has found. Generally, it happens without car owners’ knowledge. And critics say the information collected in China is beyond what is needed to meet the country’s stated goals. It could be used not only to undermine foreign car makers’ competitive position, but also for surveillance – particularly in China, where there are few protections on personal privacy. Under the leadership of Xi Jinping, China has unleashed a war on dissent, marshalling big data and artificial intelligence to create a more perfect kind of policing, capable of predicting and eliminating perceived threats to the stability of the ruling Communist Party. Those numbers are about to get much bigger. Though electric vehicle sales accounted for just 2.6 per cent of the total last year, policy-makers have said they’d like new energy vehicles to account for 20 per cent of total sales by 2025. Starting next year, all automakers in China must meet production minimums for new energy vehicles, part of Beijing’s aggressive effort to reduce dependence on foreign energy sources and place itself at the forefront of a growing global industry. There is a privacy firewall built into the system. The monitoring centre has each car’s unique vehicle identification number, but to link that number with the personal details of the car owner, it must go through the automaker – a step it has taken in the past. Chinese law enforcement can also independently link the vehicle identification number with the car owner’s personal information. There was concern that data pulled from electric vehicles might reveal proprietary information about, for example, how hybrids switch between gas and battery power, and eventually set automakers up for commercial competition with a Chinese government entity. As cars become more connected, car makers are looking to tap new revenue streams built on data – a market McKinsey estimated could be worth $750 billion by 2030. The Chinese government’s ability to grab data as it flows from cars gives its academics and policy-makers an edge over competing nations. China tends to view technology development as a key competitive resource. Though global automakers have received billions in incentives and subsidies from U.S., European and Japanese governments, they are contributing data to the Chinese government that ultimately serves Beijing’s strategic interests.